The Huntington solar training institute is just one of many training programs that the Coalfield Development Corporation offers to coal miners looking for work outside of the industry. The non-profit also trains laid off miners to work in hazmat and asbestos removal. Workers in the different programs also take classes at local community colleges. Shepherdstown-based Solar Holler works to install solar panels at businesses and organizations around the state. Deacon Stone is the President of Rediscover Appalachia and a Project Manager with the Coalfield Development Corporation. Workers who deconstruct and renovate housing units in the southern part of the state will also help renovate the new training space this winter. Until then training continues in places like Mingo county, where students are taught the ins and outs of hanging solar panels. "We have Solar Holler playing a developer role churning up business that our young people will get to educationally and experientially benefit from when they do the actual installs and we’re doing all of that work already, " Stone said. 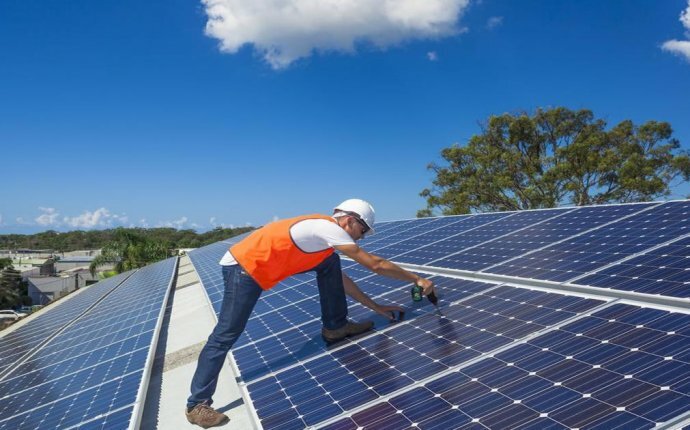 The partnership between the Coalfield Development Corporation and Solar Holler began in 2015 and has already led to some installations around West Virginia. One is at Edward Tucker Architects. The group recently bought and renovated a new space in Huntington and decided to add the solar panels to their facility. Ed Tucker is the President of Edward Tucker Architects. He said it just made sense to work with the budding relationship. "We’re really excited about Coalfield’s program and the ability to put local folks to work cause we understand that spending in our community and keeping the dollars at home and investing in the people at home is a good thing, " Tucker said. Tucker said they qualified for a USDA grant to help fund the project and are doing a leasing program for the 51 panels that sit atop the building. He said it won’t be long before they see the benefit in their electric bills. He says it's expected to cut their electric costs in half. Dan Conant is the Founder of Sollar Holler. He said it’s projects like these and more that are in the works that make the development of a training facility in Huntington all the more exciting. "It’s going to mean that we can build out our facilities so that everything they could possibly see out in the real world, they will have experienced first, " Conant said. "It’s going to speed up all the installations because they will have seen it before." The partnership choose projects based on a triple-bottom line. They look for projects that are good for people, good for the planet and good for profit to help the program continue to function as a hands on experience for laid off workers who need a new career.